If a building can be happy then without doubt the happiest building in the world yesterday was the main building at the front of Trinity College in Dublin. 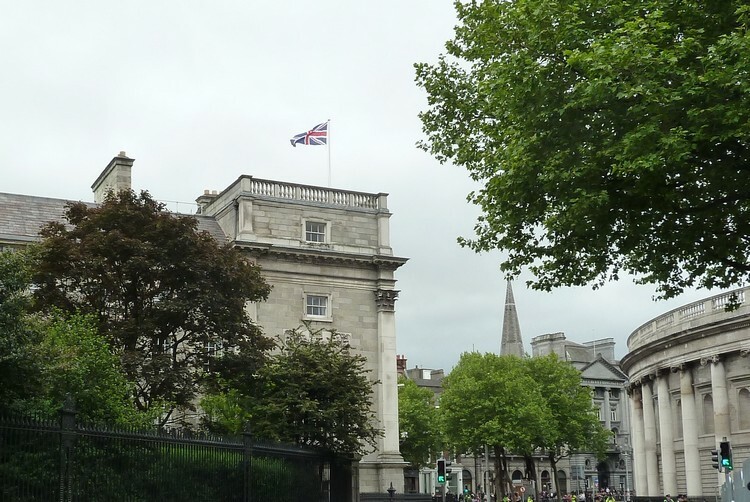 Flying on the top of the flagpole above the building, waving wildly in the stiff breeze was the Union Jack, last seen above Trinity 90 years ago. The flag was probably the same one that flew above Trinity in the early 1920s, lovingly stored all these years waiting for this very occasion. The British flag was in honor of Queen Elizabeth II who was visiting the college on the first day of her visit to Ireland. According to the media the Queen's visit is all about symbolism and protest, which you can read about elsewhere. From what I saw yesterday the spectacle of the Queen of England on the streets of Dublin was more a matter of curiosity and inconvenience than anything else. I've read elsewhere that crowds were "thin", which maybe they were, but from where I was there seemed to be a fair few people gathered. Were they all there to cheer the Queen? No, but nor were they there to heckle. Most of them were there to have a look, but more than a few were there because they couldn't get to where they wanted to go. For many days in advance there had been warnings on the radio letting us know that streets would be closed during the Queen's visit. Like a lot of people, I assumed this would have an impact on those who wanted to drive or take the bus. It hadn't occurred to me that closed meant closed to everyone not in a police uniform. For the better part of three hours yesterday afternoon you literally could not get from one side of Dublin to the other. 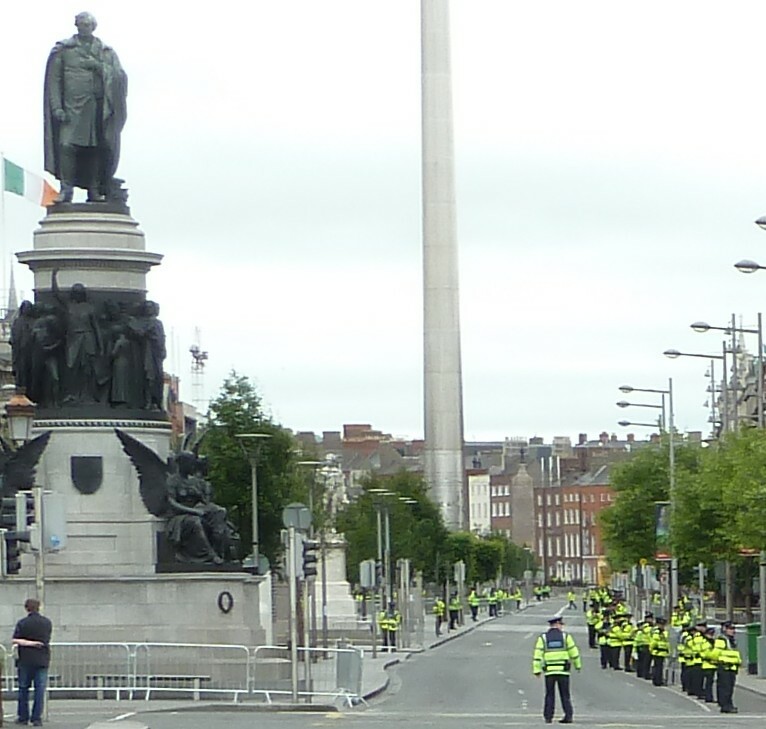 O'Connell Street was shut tight; you couldn't walk across it. Dublin was cut in two. I overheard many conversations between gardaí (police) and those who wanted/needed to get across: German tourists, members of the "new Irish" trying to get to work, men in suits who had meetings on the far side. No one was allowed over. They announced there would be a "ring of steel," but many, including me, didn't really take them at their word. Like I said, there was a good crowd and when the Queen passed by - fairly quickly encased in a Land Rover - there was some applause and one or two heckles. The people who seemed happiest to see the Queen, those clapping most, were the old people. I can only guess as to why that should be. I think part of it is the celebrity culture. We all like to imagine that celebrity culture is a new phenomenon. This ignores the fact that there were plenty of celebrities - Marilyn and Joe D were as big as any today - half a century ago. The Queen herself was a well known young celebrity in the 1940s and 50s. For a lot of those older Dubliners (and others) she still is "their" celebrity. I also think the Queen's older fans perceive her as a symbol of values that are vanishing. Whatever about her life of privilege, the Queen is admired as someone who is stalwart in her devotion to duty. She stands in contrast to many of the younger ninnying royals. Royalist or anti-royalist you couldn't help but notice how strange Dublin was yesterday. It was incredibly quiet. No traffic, no buses idling at bus stops and on those streets that were closed, but not on the Queen's route, virtually no signs of life at all. Along the route a lot of people standing waiting, but few making noise. Strange. I'm curious to see how different the city is on Monday when President Obama comes to deliver his speech outside the front of Trinity College.